Impregnation of surfaces below the Floor Slab Area before laying of hardware or prior to final concreting stage. Impregnation of surfaces below Car Porch/Apron/Terraces/Areas within five feet perimeter beyond the edge of external building walls, unless adjoining structures render this impossible. STAGE I - Before concreting Ground Slabs. STAGE II - Before concreting Car Porch/Apron. prior to final concreting stage. Motor pressure pump with a hand sprayer gun for uniform distribution of termiticide. Control Association of Malaysia/Singapore/America. It should be noted that complete protection against subterranean termites’ infestation for more than five years has been achieved with the usage of STARFOS 505 (CHLORPYRIFOS 50% w/w). The termiticide used for chemical soil treatment will have no detrimental effect whatsoever on the materials used in the construction of the sub-structures, especially re-inforce concrete works and water proofing materials. One gallon mixture of 0.5% termiticide to one metre square for basement of floor slab and apron areas.The building strategic treatment joint areas (plumbing and electrical) are to be treated at the similar rate. 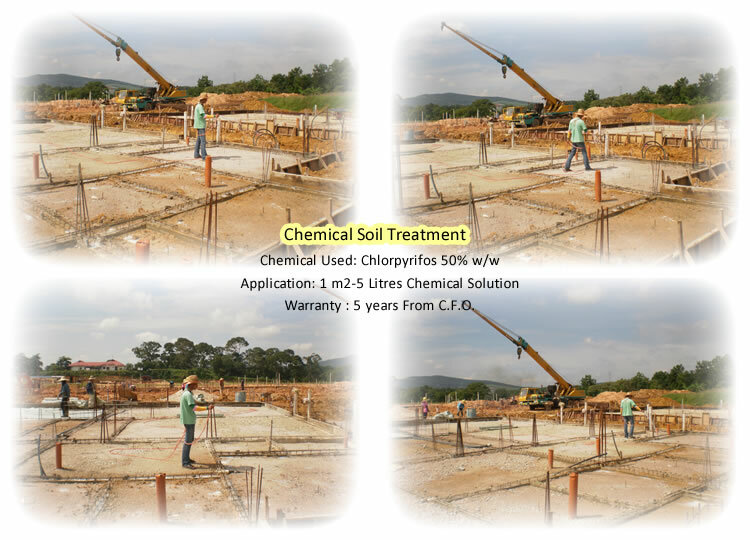 The chemical soil treatment works shall be done in conjunction with the building works at all times. The building contractor shall notify the company twenty four (24) hours in advance that he anticipates concrete casting into areas to be treated. Will provide a written warranty for a period of (5) years. The termiticide used for the treatment is guaranteed by the manufacturer to be effective against subterranean termite infestation for not less than five (5) years from C.F.O. if the termicidal barrier is intact (i.e. no digging-up of the treated soil). If the building/buildings should be affected by subterranean termites within five (5) years from the date of warranty, the company will undertake to control whatever method the company deem fit, free of charge. The benefit of this warranty is automatically transferred to any subsequent owner of the building without any formality of registration. Any extension to the building/buildings must be notified to the company and the company at an additional minimal cost must treat the land upon which the extension is built. Failure to make such notification and treatment will invalidate this warranty. The terms of warranty can be assured of being upheld for the entire period of time. 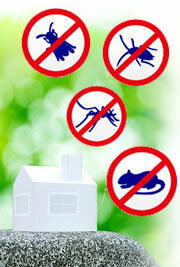 The company will provide free yearly termite inspection during the entire period of time. It would take one day to mobilize our teams for the soil treatment.